For tears: Reading Tim Grierson’s take on the saccharine Viggo Mortensen/Mahershala Ali film The Green Book won’t make you cry, but the movie might. For lols: Thanksgiving may be over, but if you need a laugh, look no further than Miles Klee’s ode to the treacherous wild turkeys that overran the town where he used to live. For help: Hosting a party that just won’t end? Jedi mind-trick your guests into leaving. Trying to figure out why your plane tickets cost so much? Here’s why they’re actually a great deal. Ever wonder which type of chicken wing — the drum, the flat or the boneless — reigns supreme? Consider what the pros have to say. If you don’t like feeling uncomfortable — or uncomfortable laughter — you probably won’t like the movies of Yorgos Lanthimos. Tim Grierson has thoughts on Lanthimos’ brilliant new film, The Favourite, and its continuation of the director’s disturbing and darkly comic oeuvre. If you’re backed up still from your massive Thanksgiving dinner, milk of magnesia is great for constipation. But if you’re dealing with heartburn, skip the Pepto and the TUMS and go straight for Mylanta — because you can’t beat aluminum hydroxide for stomach acid issues. Running out of deodorant or cologne is no excuse for stinking up the joint if you’ve got a perfectly good spice rack, or a tube of toothpaste. Both can be MacGyver-ed in a pinch to ward off the foul stench coming from your pits. Calling your partner “fat” — intentionally or otherwise — isn’t a diss on them, it’s a diss on you. It’s also not a relationship killer, but it is cause for a lot of introspection, according to a clinical psychologist. After all, when you make such a massive faux pas, it typically means you have a lot more issues with yourself than you do with the recipient. 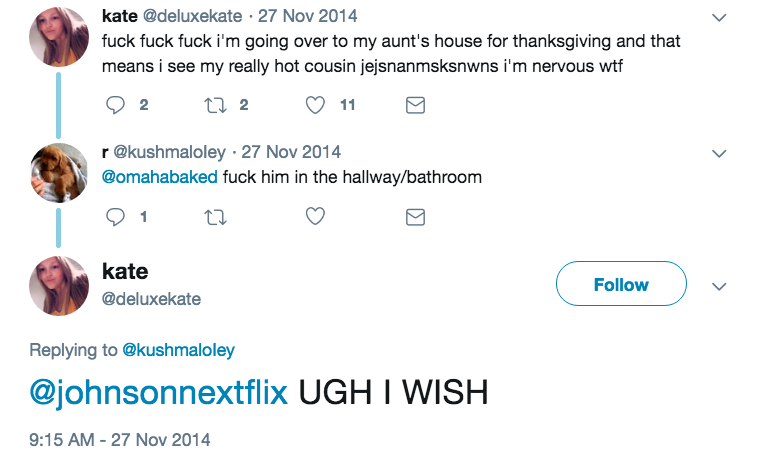 Only a few years ago, the period between Thanksgiving and Christmas was known as “Hot Cousin Season.” Back then, if you searched “hot cousin” on Twitter, you’d find endless tweets from deranged people talking about their very attractive extended family. But recently, the phenomenon has disappeared. What do guys buy to make themselves feel better? All types of stuff, it turns out, and not just a shocking amount of Chinese food. Contrary to popular belief, there are plenty of chores guys actually like to do. Quinn Myers spoke to 11 gentlemen about their favorite ways to help around the house, and God bless the guy who likes washing the dishes, because personally I’d rather get punched in the face. Features writer C. Brian Smith spoke with Patton Oswalt and other stand-up legends about UnCabaret, the groundbreaking alt-comedy show from the early 1990s that not only paved the way for a far more inclusive industry, but also far more complicated and introspective punchlines.